I have the pleasure of facilitating strategic planning sessions, process improvement events, team building activities, etc. 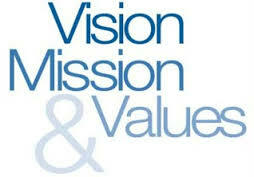 I always start with the vision, mission and values of the organization. Because if the discussion isn’t aligned, if the goals aren’t aligned, if the changes aren’t aligned, if the commitments aren’t aligned, etc., the time, as I see it, is wasted. How does it see itself? How does it plan to get there? What principles are going to guide it along the way? In my opinion, every decision, every action, every goal, every behavior, etc. needs to be aligned with the organization’s vision, mission and values. How else can leadership and the workforce focus? How else can resources be properly allocated? How else can you motivate? How else can you prioritize? How else can you say no to things that pull you off track? I bet your organization’s leadership tends to have the Google Earth View of these things. They talk about them during Strategic Planning Sessions, they talk about them when they dust off the Balanced Scorecard, they talk about them when the annual report is being published, etc. Why wait for that to trickle down to you and your team? Why wait for someone like me to ask the questions during an action planning event? Why wait for someone like me to bring up YOUR vision, mission and values during a team building event? Why wait for ANYONE ELSE to discuss your organization’s vision, mission and values with your team? You’ve got their undivided attention, so bring the Vision, Mission and Values into the conversation NOW! They aren’t only words. They serve as your organization’s map but they need to be brought down to Street View. Dare I say you may be lost without them.